A special Mass to mark the Feast of St Joseph will take place in St Mel’s Cathedral Longford next Saturday to pray for the wellbeing of families, marriages and the protection of human life in Ireland. Bishop Emeritus of Ardagh and Clonmacnois, Dr Colm O’Reilly, will celebrate the liturgy which will be preceded by Rosary and a procession to altar of the Holy Family in the cathedral. It is being organised by An Teaghlach Naofa (The Holy Family), a prayer network founded to honour of the Holy Family of Nazareth, Jesus, Mary and Joseph, and under the patronage of St John Paul. An Teaghlach Naofa has explained that it is devoted to praying for the county’s bishops and priests as well as the people of Ireland and the protection of the sanctity of marriage, the family and human life. 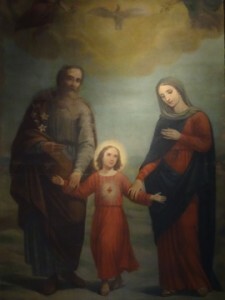 The group has placed special importance on the painting of the Holy Family in St Mel’s Cathedral, Longford which was commissioned by Bishop Woodlock for the cathedral at the turn of the 20th century for the Holy Family Altar where marriages were solemnised for many decades. The work in the cathedral was painted in Rome in 1891 and is a copy of a painting by the Spanish artist Murillo. The painting miraculously survived the devastating fire which destroyed St Mel’s at Christmastime 2009. “The painting has a special place in the heart of the parish of St Mel’s and in the Diocese of Ardagh and Clonmacoise,” An Teaghlach Naofa has said. The group is urging those driving through the heart of Ireland to take time out and visit St Mel’s Cathedral Holy Family altar, and to see the miraculous painting, and to pray to the Holy Family for families in Ireland.